The region around a star within which planets with sufficient atmospheric pressure can support liquid water at their surfaces is known as the habitable zone or, alternatively, the Goldilocks zone. Closer to the star the temperature is too high, and water would vaporize. Further away the temperature is too low, and water would freeze. Due to the importance of liquid water to life on Earth, its presence is believed to be a key indicator of the possibility of finding life elsewhere. Based on data from the Kepler space observatory, launched by NASA in 2009 to discover Earth-like planets orbiting in the habitable zones of other stars, estimations indicate that there may be as many as a few dozen billion Earth-sized planets orbiting in the habitable zones of Sun-like stars and red dwarfs in the Milky Way. But what about our Solar System? Earth is not the only planet in the Sun’s habitable zone. Mars is too, and so is Venus, albeit barely. Let’s focus then on Mars. Mars, like Mercury, Venus, and Earth, is a terrestrial planet: it has a solid surface, and it is primarily composed of a metallic core and a silicate mantle. It has a thin atmosphere and surface features reminiscent of impact craters, volcanoes, valleys, and desserts. It has also polar ice caps like those on Earth. But what about liquid water? While many lines of evidence indicate liquid water may have played a significant role in the planet’s past geologic history, NASA announced on Monday, September 28, that seasonal streams may be flowing on Mars, today. The discovery was made by a team led by Georgia Institute of Technology planetary scientist Lujendra Ojha, using NASA’s Mars Reconnaissance Orbiter. NASA/JPL-Caltech/Univ. of Arizona. Satellite images and elevation data are combined to give the impression of height in this false-color image. The team studied images of seasonal trails of sludge on the surface of Mars. For these to happen, one of the hypotheses is that underground briny water reservoirs could find a way to the surface due to geological shifts. While pure water would freeze, salty water has a much lower freezing temperature, and would flow down the surface leaving a trail during the summertime. Infrared spectroscopy data seem to confirm the presence of hydrated salts when the flows were present. Nevertheless, the origin of this water is still a mystery, and further research is needed. 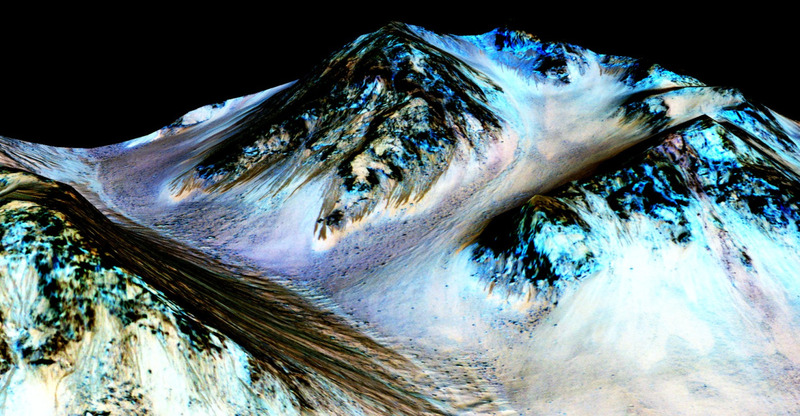 If there is life on Mars today, chances are it may be there. Exciting times ahead. Interestingly, one of the places these streams have been found is close to Acidalia Planitia, the landing site of the Ares 3 mission in The Martian. Have I said I cannot wait to finally see Mark Watney in theaters this weekend? Its proximity as the next planet in our solar system, and its Earth-like seasons, storms, volcanic flows, mountains, and now flowing water stir the human desire to explore. The visible red hue, born from iron oxide in the soil, connote war—thus the name Mars, the Roman god of war and protection, who, according to legend, looked after the civilization as it evolved into an empire. In honor of this mythically potent and scientifically fascinating planet, Frost Science has named our men’s funding group MARS (Men Advocating Real Science). This groups mimics Frost Science’s women’s funding group Venus Orbit.